Thinking of what dessert to make this coming Chinese New Year? Why not try this super easy Osmanthus And Chestnut Koi Jelly which I am sure your guests would be impress with those cute and auspicious Koi Fish (锦鲤) and Ingot (元宝). With just 3 main ingredients such as Osmanthus Flower, Konnyaku Jelly and Water Chestnut you could easily replicated this dessert which is similar to Osmanthus Cake (桂花糕) but in jelly form rather than cake. 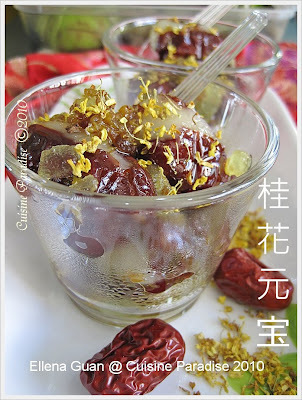 For this jelly dessert I did not add any food colouring and the "golden colour" effect comes from the natural colour of the Osmanthus flowers itself. So if your prefer a darker colour, you could either add in a teaspoon more of the Osmanthus flower or a few drops of yellow food coloring. 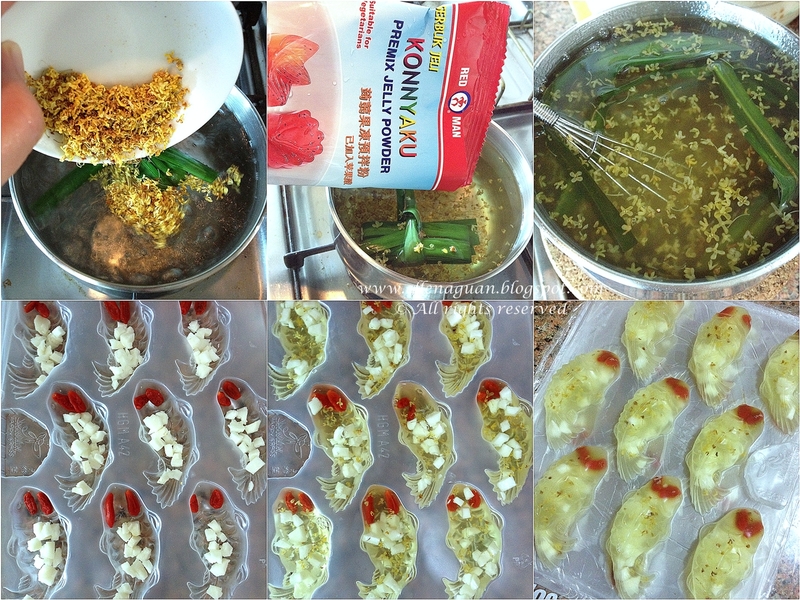 But if you cannot get hold of any Osmanthus Flower or Konnyaku Jelly, you could try another flavour instead of Osmanthus using Lemongrass with a reference recipe here. As for the Koi And Ingot jelly mould, you could get it from Kitchen Caper. I bought mine with 3 different assorted mould for S$5.00 during their festive promotion. 1. In a pot, add 1200ml of water and bring to boil together with pandan leave for 3 minutes to infuse the water with pandan leave fragrance. 2. Lower the heat, add in osmanthus flowers and simmer on low heat for 2 minutes. 3. On the lowest heat, slowly stir in Konnyaku Jelly Powder using a balloon whisk or wooden spoon until powder fully dissolved. Turn off the heat and remove from stove. 4. Add 2 wolfberries (pre-soaked in water for 3 - 5 minutes till puff) and 1/2 - 1 teaspoon of water chestnut in each jelly mould (refer to the photo above). 5. Slowly pour in jelly solution into the prepared mould. Cool and chill in the fridge for at least 2 hours to firm it before serving. If you have no time to involve yourself in the kitchen, perhaps a cup of this refreshing Osmanthus Honey Tea (recipe) will be great to help smoothing your mood as well as detoxification and beauty maintenance. Lastly in order for those who are interested to try our Osmanthus Flower. 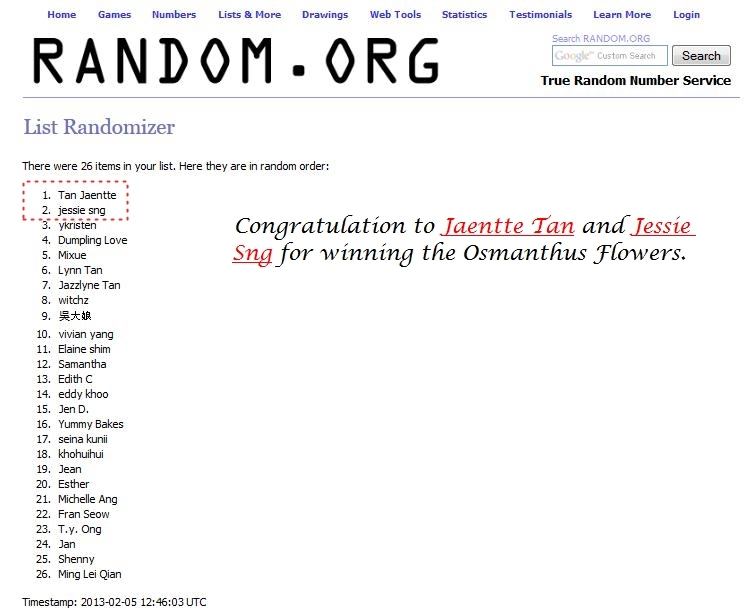 I would be giving away 2 trial packet (4g each) of Osmanthus Flowers to 2 Lucky Readers to try out some of the related recipes that I have shared. 1. 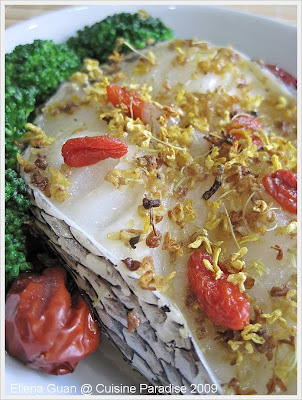 Comment (on this post) which recipe with Osmanthus Flowers that you would like to try. Leaving a comment (on facebook) that you have "Like And Share" the above. *Giveaway is open to ALL READERS of Cuisine Paradise with a valid mailing address.